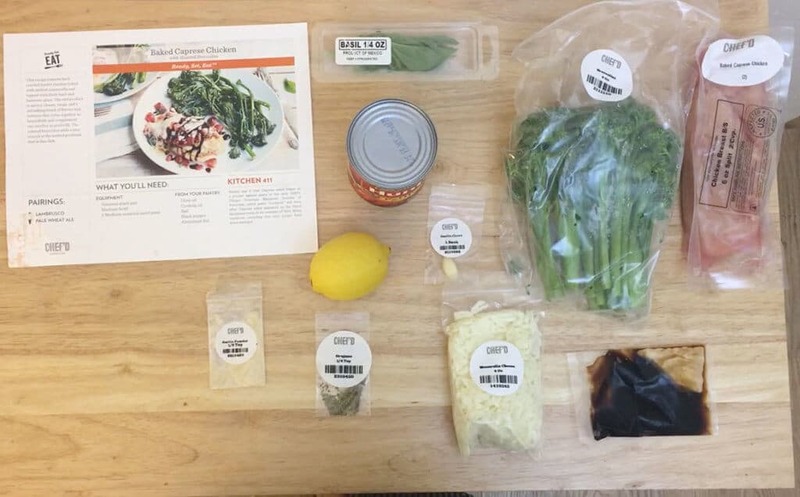 Chef’d Review: The Biggest Least Known Meal Delivery Service? If you’re still on the hunt for the perfect meal delivery service that provides you with quality ingredients and delicious recipes to prepare in your own kitchen, you might want to check out Chef’d. They offer a weekly subscription service that allows you to join one of their meal plans, which are all done in collaboration with other well-known brands in the health industry. You’ll find plans with Atkins, Weight Watches, and the American Diabetes Association, just to name a few. Not only that, but they allow customers to order a la carte meals, which is something not many services offer. 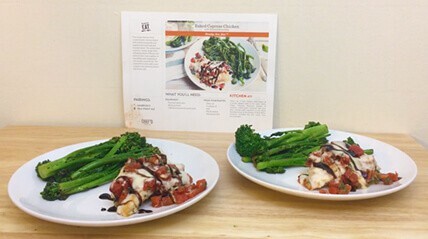 Chef’d is serving their customers by giving them exactly what they need to create amazing meals at home. It couldn’t be easier to get in the kitchen and start cooking! Plus, they’ve made everything affordable (compared to some of the other guys out there). If you’d like to place your first order with Chef’d, it’s easy to get started. All you have to do is begin by making an account on their website. From there, you’ll be able to choose what you’d like to purchase. Chef’d allows their customers to order from a meal plan, but they also give you the ability to purchase a la carte items. This is something not all meal delivery services provide. For those who would like the structure of a weekly meal plan, there are quite a few options to choose from. They’ve actually collaborated with some big names to bring you tasty and healthy options for you to dine on. 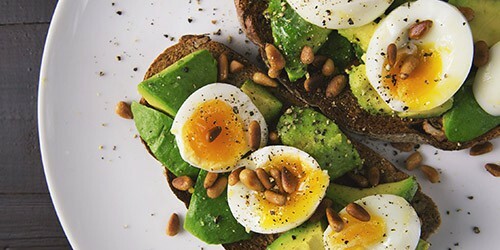 You’ll find a meal plan they’ve done in partnership with the American Diabetes Association, which makes it easy for those with diabetes to stick to a balanced diet. For those who choose to eat low-carb meals, you can select the Atkins meal plan, which focus on less carbohydrates and more proteins. There’s even a meal plan from The New York Times cooking, which provides you with a selection of recipes that have been curated by culinary pros. If you’d prefer to stick to the a la carte menu, you can order anything that happens to catch your eye—there are no limits. Chef’d provides options for breakfast, lunch, dinner, and dessert so you’ll have plenty to choose from. For most items, you’ll have the option to purchase two or four servings of a particular dish. They clearly state the prices on the menu as well, so you don’t have to worry about going overboard with your order. Once you’ve placed your order, you can expect a box with fresh, pre-portioned ingredients and recipes to arrive at your doorstep. You’ll have everything you need to whip up a delicious dish for you and your family to enjoy. With options for every meal of the day, there’s a lot to choose from when it comes to Chef’d. For breakfast, you’ll find dishes like the Beach House Breakfast Casserole, Spinach Scramble, Peanut Butter Acai Bowl, and the Sunny-Side Up Eggs and Turkey Hash. There are plenty of other morning dishes including eggs, toast, smoothie bowls, and even the Cinnamon Morning Buns. When placing your order for lunch dishes, you’ll find selections such as: Buffalo Chicken Salad, Carne Asada Tacos, Southwestern Black Bean Casserole, Honey Grilled Peaches with Caprese Salad, Warm Farro and Lentil Salad, and the Tavern Burger. When making your dinner selection, you’ll choose from dishes like: Chicken Cauliflower Mac and Cheese, Chimichurri Steak, Thai Basil Chicken Stir Fry, Red Snapper with Tomatoes and Olives, and Spicy Ahi Tuna Salad. If you need something to satisfy your sweet tooth, you’ll get to choose from: White Chip Lemon Bars, Perfect Chocolate Chip Cookies, Red Velvet Cream Cheese Squares, No-Bake Toffee Fudge Bars, Unbelievable Fudgy Brownies, and the Decadent Chocolate Lava Cake. If you’re interested in placing an order with Chef’d, they deliver to all zip codes located within the contiguous United States. Unfortunately, this means that those in Alaska and Hawaii are out of luck because they’re not able to deliver to these states. However, from what I read, it looks like they’re trying to expand! The day on which your Chef’d order arrives will depend on the delivery options that are available for your area. Typically, delivery takes place anytime between Tuesday and Saturday. Once you’ve entered your zip code during checkout, you will see the actual delivery date so you’ll know exactly when your package is expected to arrive. There’s also no need to be home during the time of delivery because a signature is not required for drop-off. If your order is being delivered to a home, you can expect the courier to leave your package sometime between 8 AM and 8 PM in your time zone. You can also include any special delivery instructions for the courier if needed. There’s an option to add this information when you are on the “Your Cart” page during checkout. If at any time you’d like too pause your Chef’d subscription, you are able to easily do so via your online account. This allows you to skip weeks when you’d like to take a break from Chef’d meals or if you’re going to be out of town. You’ll be able to resume your subscription again as soon as you’re ready and deliveries will pick up again. Chef’d claims that they are committed to reducing their carbon footprint, which is why much of their packaging materials are recyclable. They’ve sought to use as little packaging as possible, while still make sure your food is protected during transportation to ensure quality. The outer shipping box, food bags, cups, and bottles are all recyclable. These are items that can be put out with your usual recycling if your neighborhood has a designated pick-up time. If not, you can always take them to your local recycling center. There will also be gel freezer packs inside your box to keep the food cold. These freezer packs are 100% non-toxic. If you’d like to dispose of them, you can cut open the gel pack and pour the gel down the sink, using running hot water to rinse. Chef’d recommends letting the water run for a couple minutes to make sure the gel flushes through the drain. The outer plastic can then be recycled normally. Alternatively, you can keep them for reuse if you’d like. The foam insulation included in your box is also non-toxic and it’s made of 100% sustainable materials. It’s reusable if you’d like to hold onto it. If you’d rather toss it, be sure to recycle it at a polyurethane recycling depot for proper disposal. As with any meal delivery service, it’s important to make sure the food stays fresh during transportation. If it doesn’t, it risks spoiling before it arrives on your doorstep and will become unsafe for you to consume. Fortunately, Chef’d has take the necessary precautions to ensure their food stays fresh as it travels to you. As mentioned above, they use frozen gel packs and place everything in a well-insulated box to keep the ingredients cold. The shipping time frame is only one to two days, so it’ll do its job in keeping everything at the optimal temperature. Once the order has arrived, you may wonder how long you have to eat the food. At the time it arrives to your home, all of the items will be fresh and ready for you to enjoy. However, you will need to unpack the box as soon as possible and place all cold items in the refrigerator (not the freezer) for proper storage. 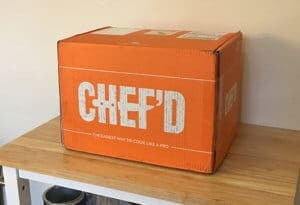 Chef’d recommends cooking seafood within two days to maximize freshness, but you can consume all other proteins within four days of receiving your box. The ingredients you receive in your box are sourced directly from trusted farms and ranches to ensure their quality. Chef’d also strives to purchase food from organic farmers whenever possible. They want to make sure they’re using the freshest product and proteins when sending ingredients to their customers. You can feel confident that you’re getting high-quality ingredients with every box. One of the great things about Chef’d is that you don’t need to be an expert into the kitchen to whip up one of their meals. They’ve made it easy by providing customers with pre-portioned ingredients and easy-to-follow instructions. Their recipes will guide you through the process of cooking up a great meal so you’ll have dinner on the table in no time at all. While Chef’d does provide you with most of what you’ll need to prepare your dinner, you are expected to have a few kitchen essentials. You’ll want to have the usual kitchen utensils like pots, pans, knives, and spoons. In terms of seasonings, you should stock up on things like olive oil, salt, and pepper so they’re on hand when you need them as you’re cooking. Each recipe clearly states which ingredients you’ll need, so you’ll be able to prepare ahead of time. With plenty of options for breakfast, lunch, dinner, and dessert, you’re sure to find something everyone in your home will love when ordering from Chef’d. They’ve done a great job at providing a wide variety so you’ll never get bored with their selections. Not only that, but the ability to purchase a la carte meals makes it easy to get exactly what you want. One tasty breakfast option is the Amaretto French Toast and Candied Bacon. It’s perfect for a lazy weekend morning when you want something more filling and aren’t in a rush to get out the door. It’s a rich and satisfying way to start your day. For those quick mornings where you’re in a hurry, the Quaker Overnight Oats with Strawberries is a nice choice. And their Avocado Toast with Prosciutto & Sunny Side Egg is definitely one of the tastiest we’ve had! For lunch, the Chicken-Mango Fajitas are flavorful without being too heavy of a meal. The sweet mango adds so much flavor to the dish and the avocado makes it creamy and delicious. We also love the Spinach Pesto Grilled Cheese for a twist on your favorite childhood dish. It’s the perfect comfort food that you can enjoy with very little guilt afterwards. A great dinner option is the Spicy Tomato-Jalapeño Chicken Breast. The chicken was tender and tasted fresh. The sauce that tops it adds just the right amount of flavor and kick thanks to the jalapeño. The Spaghetti and Drop Meatballs is another great option for anyone craving a tasty pasta dish. If you have a sweet tooth, you’re going to love the Glazed Lemon Bundt Cake and the Almond Crusted Chocolate Truffles. Both are going to satisfy any sugar cravings that pop up! If you’re looking to purchase a meal plan through Chef’d, you can expect to see prices ranging from $9 to $17 per serving. Your final cost will ultimately depend on the ingredients required for your dish. The reality is, some ingredients are more expensive than others, which will drive up the price on a few of the dishes that Chef’d has to offer. That being said, around $9 per serving is what most of the major meal delivery services charge. For a la carte meals, the price will still vary. You can choose to purchase either two or four servings. Their menu clearly states prices so you can always see how much something will cost before you make your purchase. You won’t be charged shipping for any orders over $40. If your order total is below $40, you will be charged a $10 shipping fee. With the ability to choose a meal plan or order a la carte meals, Chef’d really stands out from other meal delivery services. They’ve given their customers a lot of control when it comes to placing their orders because they’re able to select exactly what they need in terms of dietary needs and preferences. I would go as far as saying they have the most diet variety available due to their partners (Atkins, American Diabetes Association, etc). It’s especially helpful if you have any picky eaters that you need to feed! Since they offer so many meal selections, you’re sure to find something everyone in your home can enjoy. From breakfast to lunch and dinner, all of your meals can be easily planned out when ordering with Chef’d, which is a huge bonus. Chef'd has the most amount of variety and brand partnerships when it comes to meal delivery kits. No other service even comes close. do you have organic ingredients? my husband has type 2 diabetes can I order ala carte for him and still have family friendly meals for the rest of the family? Hi Margay! Yes, you can. With Chef’d you can order from their “American Diabetes Association Meal Plan” and then order whatever you want from other meal plans :-).